A hay barn is an ideal structure for storing hay. Nutritionally speaking, hay stored in a barn maintains more of its nutritious value than that which is left exposed to the elements. One of the most basic hay barns popular with DIYers is a pole barn. 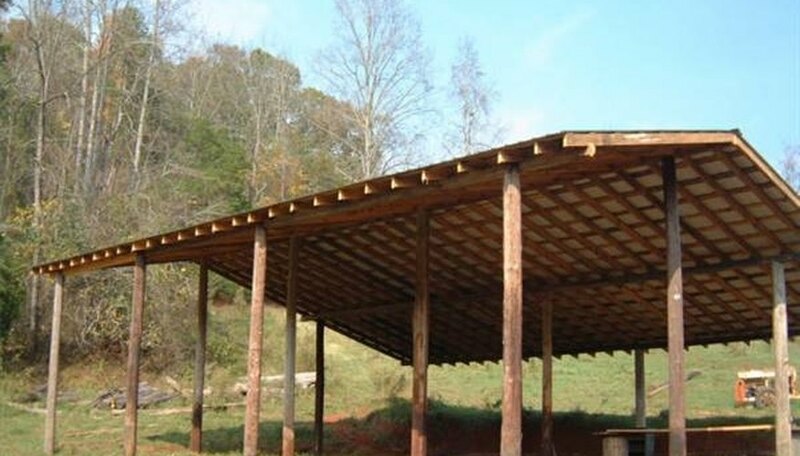 This article will provide you with some tips, steps and safety precautions to keep in mind while building a pole barn for storing hay. Select a spot that is near your harvesting sites or near where you will feed your animals, yet far enough away to keep them safe in the event of a fire. Since hay is highly flammable, be sure to build your hay barn at least 75 feet away from other structures. To prevent water from collecting on or seeping through the floor of a hay barn, it should be built in a location where rain and snow melt drain away. Aim for a downward slope of at least five percent, or a five-foot vertical drop per 100 feet horizontally. Grade the ground where the floor of the hay barn will lie toward the center of the floor to prevent stacked bales of hay from tipping out. 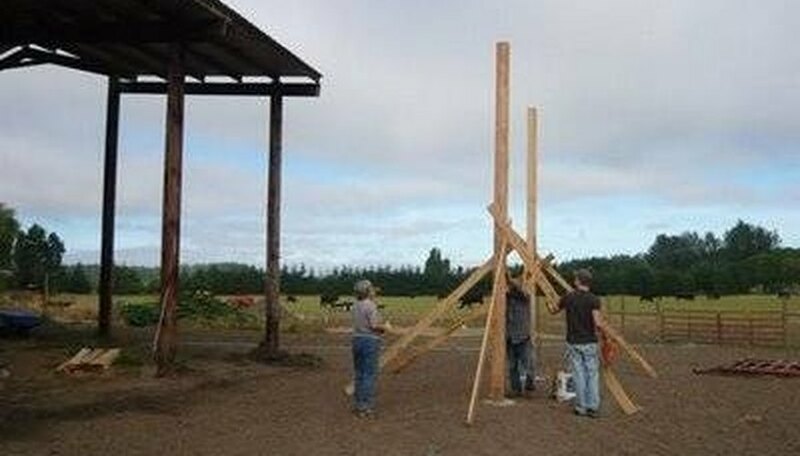 Consider the orientation of your hay barn. To reduce wind loads on the structure, position your hay barn with the open end facing away from prevailing winds. Plan your barn's access to include enough room for maneuvering trucks and any hay-lifting equipment you plan on using to transport hay. Dig holes for the post and place your stake in the slot corners. Fill in a concrete base for maximum support. Brace the poles upright, and make sure they are completely secure. Use roofing nails to nail on the tin roof. Short sections of the roofing will need to be overlapped to give it extra protection against the elements. Lay down or pour your floor using your choice of materials, or feel free to leave your floor bare. It is not uncommon for hay barns to have dirt floors. 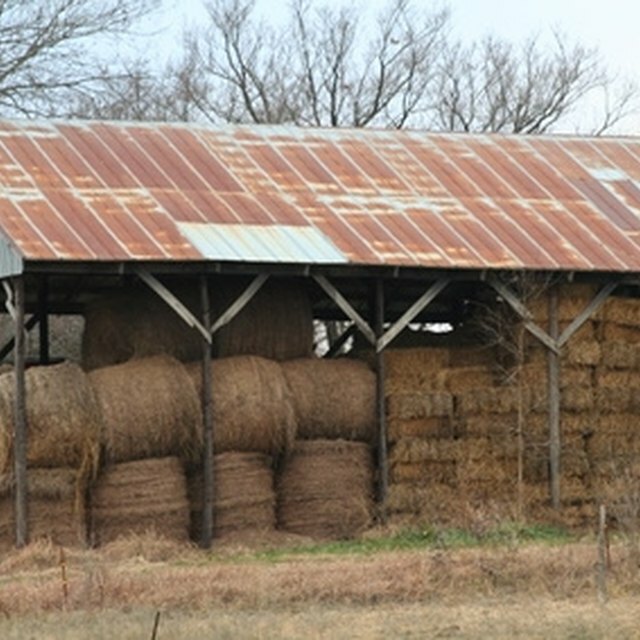 Many parts of the country require that outside structures like hay barns meet building safety codes and be inspected by a county or town official. Check your town's rules as you may be required to get any design plans approved prior to beginning construction. Building even a small hay barn is not without its hazards -- especially when it comes to building the roof. Be sure to install some sort of guard rail, safety net or a fall arrest system when working on your barn's roof, especially if it is more than six feet high.